The German Federal Ministry of Labour and Social Affairs and the OECD jointly organised a High-Level Policy Forum on the New Jobs Strategy on 13 June 2017 in Berlin. High levels of inequality, slow growth in productivity and wages, and profound labour market transformations following the digital revolution, globalisation and demographic changes pose major challenges for policy makers of OECD and emerging economies. The OECD Jobs Strategy provides detailed policy recommendations across a broad range of policy areas in order to help countries address these challenges. It goes beyond job quantity and considers job quality and inclusiveness as central policy priorities, while emphasising the importance of resilience and adaptability for good economic and labour market performance in a changing world of work. 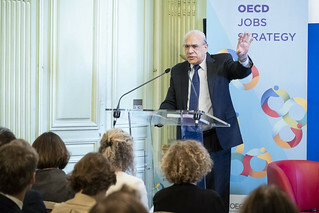 The OECD Jobs Strategy was officially launched 4 December 2018 at a joint event organised by the OECD and the French Ministry of Labour, when Ministers and other high-level representatives expressed their support for the new Jobs Strategy. The OECD actively supports member and partner countries with the implementation of the Jobs Strategy through the preparation of special chapters in the OECD Economic Survey and Jobs Strategy Implementation Notes.